Alfred Gore was born in Kintbury in April 1887 the son of Alfred Gore and his wife Georgina née Randall. Georgina was a Kintbury lass, but Alfred senior was from Newbury, to where the family moved in the early 1890s. It was a large family; Alfred had four brothers and six sisters, by 1900 they had settled in a small terraced house off York Road, in a group of such houses known as Adey’s Buildings after the builder who erected them and let them out. The Gores lived at number 7; the house still stands in the small lane now known as Adey’s Close. Alfred senior was a bricklayer, a trade that Alfred junior also followed, no doubt learning the necessary skills from his father. Newbury was expanding rapidly at this time so there would have been plenty of work for bricklayers. On 25 May 1912 Alfred married Alice Stanbrook and they set up home at 6 Woodbine Cottages, Railway Road, Newbury, not far from his parents in Adey’s Buildings, but noisier and, I suspect, dirtier as Railway Road, as the name suggests, ran alongside the railway line. Their son, Norman Alfred, was born on 31 August 1914, less than four weeks after Britain declared war on Germany. With a new baby in the house some men might have been keen to join up and ‘do their bit’ – if only to get a good night’s sleep, but Alfred was not yet ready to leave his new family and go off to war. This was unlikely to have been influenced by any conscientious object ion – in his youth Alfred had served with the Berkshire Volunteers (re-organised in 1908 into the 4th (Territorial) Battalion, Royal Berkshire Regiment). Alfred’s sister Florence married a neighbour, Jack Himmons, who lived at 11 Adey’s Buildings. The same age as Albert, Jack had been a regular soldier and was still a reservist in 1914. On the outbreak of war, he was called back to the colours. Jack was the first Newburyian to die in the war - a day after being wounded and captured at the Battle of Mons. Jack’s son, Frederick, was only six months old. A close family tragedy like this must also have influenced Alfred’s decision not to rush to sign up. 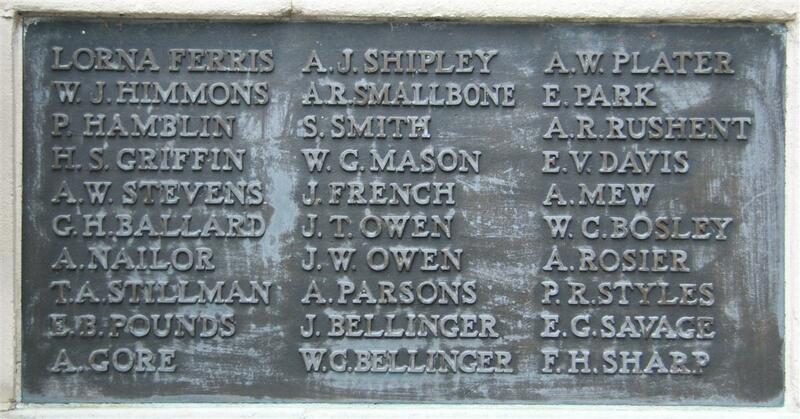 The first panel of names on the Newbury War Memorial - Alfred is the last name in the first column, his brother-in-law, W J (Jack) Himmons in the second name on the memorial. Towards the end of 1915 the need for more men in the armed forces had led to the creation of the ‘Derby scheme’ (named after Lord Derby, Director General minister for Recruiting) as a means of encouraging men aged 18-40 to sign up for duty at an undefined later date; the scheme was not a great success and was replaced by conscription in 1916. However, Alfred was one of the men who came forward and attested on 8 December 1915. At that date he registered for service and underwent a medical before being ‘posted’ to the army reserve. The medical passed him ‘fit for garrison duty, home or abroad’. He was not deemed fit for combat service owing to a number of varicose veins and a varicosele. His level of fitness did not prevent his call up and he reported for service on 24 May 1916. He was posted first to the 3rd Battalion, Royal Berkshire Regiment, for training before being moved on to the regiment’s 10th (Labour) Battalion. Evidently very little training was required for labouring duties as he embarked at Southampton on 19 Jun, bound for Le Havre. It is easy to see that Alfred’s skill as a bricklayer would be of great use in France where massive building works supported the war effort. So Alfred was put to work with the rest of the battalion, unloading supplies from ships at Rouen. Apart from losing himself a day’s pay for slipping off into town when he should have been with a work party on the quay he had a quiet time in Rouen, well away from the front line. In 1917 the labour battalions/companies from the various regiments were absorbed in a new organisation, the Labour Corps. Half of the 10th Royal Berks, including Alfred, became the 158th Company of the Labour Corps on 10 May 1917, all of them receiving new service numbers; the rest of the battalion became the 159th Company. The new Company was soon much closer to the front that Rouen. During the Battle of Passchendaele men from the Labour Corps were in close support to the front line, following the advancing troops, well within the range of the enemy guns. Almost as soon as a shell blasted a crater in the road the Labour Corps was there filling it in. Such proximity to the front meant that casualties were inevitable; on 8 October Alfred died of wounds received at a dressing station set up at a farm a few miles northwest of Ieper (Ypres). Gore - Killed in action, somewhere in France, on October 8, 1917, Alfred Gore aged 30, the dearly beloved husband of Alice Gore, of 6, Railway-road, Newbury, and eldest son of Alfred and Georgina Gore, of 7, Adey's-buildings, Stroud Green, Newbury. His body lies in the Canada Farm Cemetery (named after the farm used as the dressing station) in plot III.A.30. He is also remembered on the Newbury Town War Memorial. Alfred's brothers Fred and Henry also served in the Navy and Army respectively. In 1922 his Victory and British War Medals were sent to Alice Flitter. His widow, Alice having remarried, to Frederick Flitter, in 1919.